Once upon a time, I remember life being a lot simpler. I was able to focus on one thing at a time and do it well. Lately, it seems to me that we live in a world where we must be “everything to everyone all of the time”. This is difficult, as there are not enough hours in the day to achieve everything. You are better served in prioritising what is really important to you, then tackling these goals with a calm, focused and singular resolution. My Sensei has always talked about the importance of focus and awareness. This is Zanshin, i.e. a state of awareness and of calm preparedness. Your mind must be completely engrossed on the activity you are partaking in. Zanshin is being constantly aware of your body, emotions, and situations. You are aiming to be natural in everything you do. It helps you live your life with purpose, rather than being easily led with all of life’s distractions. In class yesterday, I tested this concept of Zanshin with the students by purposely taking them out of their comfort zone. They had one chance to get their Self Defence technique or ‘Multiple Defence’ right. Some succeeded, while some did not. And because of that, all students learned valuable lessons. Sometimes in life, you only get one chance to get things right. Therefore, with everything you do, you will be better served by approaching things with complete focus and concentration. You must sharpen that “Zanshin” sword with everything. not feel 100% committed to every action? stop paying attention to the (so-called) little things, such as breathing, feeling the uniform on your skin, the mat under your feet, positioning of your body and the intent you have on every movement? not feel switched on, mentally or emotionally? feel as though you already “know it all”? Remember, Zanshin is performing with focus and energy, irrespective of whether the objective has already been achieved. While I place these tests on students, it is simply a reflection of my own experiences. I have been training and / or teaching martial arts every day for over 15 years. During that time, I have experienced all of the above feelings at one point or another. And because of that, I now know that the enemy of improvement is lack of commitment to the process. The right process is everything. You cannot judge progression on results, as results cannot always be proven. However, commitment to the right process is the best way to judge your progression. If you can continually do the right process irrespective of what you are feeling inside, you will get progression from every minute of class and life. Repetition is the mother of all skill. Fall in love with the repetition. Fall in love with the focus and concentrated effort, and you will be successful. Finally, while we preach the concept of Zanshin in martial arts, you must practice it outside of class. We are coming up to Christmas. Christmas can be incredibly stressful, because there are lots of things to do and people to please. People get so focused on “the hassle”, they forget it is all about family and friends. This Christmas, pay attention to every conversation with your family. Listen to what is being said. Hear the emotion in the conversation. Even if things get busy, focus on the joy your actions are bringing to others. 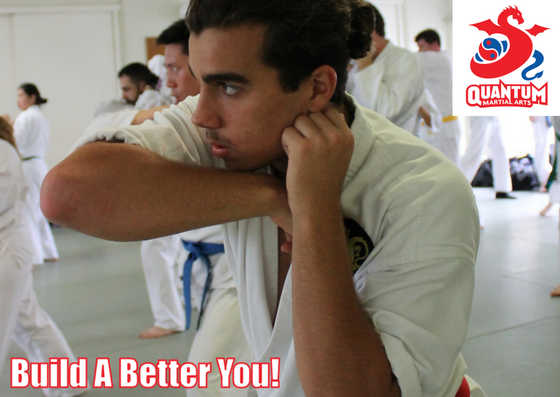 Remember, it is the ability of the evolved martial artist to use the lessons from the dojo in their everyday life to promote peace and harmony.